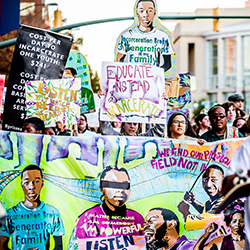 This resource is an exploration of the intersection of arts, culture, and housing outcomes – focused specifically on work within the housing sector that seeks to build and maintain high quality housing affordable to low-and moderate-income markets. It touched on housing trends ranging from the affordability crisis and equitable development to homelessness and vacancy, and surfaces needs in the housing sector that arts and culture might address, a framework for understanding the ways can partner with the housing sector, barriers to integrating arts and culture within the housing sector, strategies to advancing collaborations. 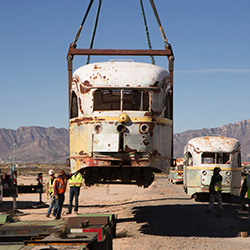 ArtPlace commissioned Transportation for America (T4A) to write and produce a rigorous national examination of creative placemaking in the transportation planning process. This resource identifies ways that transportation professionals can integrate artists to deliver transportation projects more smoothly, improve safety, and build community support.This field scan explores seven of the most pressing challenges facing the transportation sector today, and identifies how arts and cultural strategies can contribute to solutions. 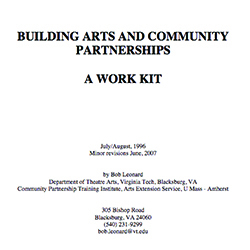 The questions in this work kit provide a structure for developing and planning an arts and community partnership.It is intended to tease out assumptions that lie within the impulses for the project. To build an effective partnership, these assumptions must be known and shared. 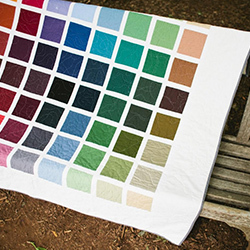 The process in this kit will aid in creating consensus and discovering the way to informed agreement. 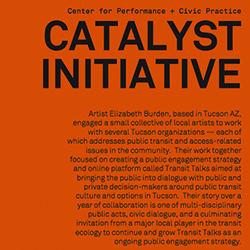 This is the first series of reports on the Catalyst Initiative, a program of the Center for Performance and Civic Practice. It chronicles the one-year journeys of artists teaming up with non-arts partners within a community to tackle projects ranging from community engagement and visioning processes to creative education practices and organizational capacity building. 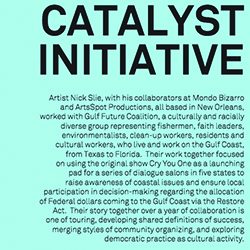 In this project, artist Nick Slie, with his collaborators at Mondo Bizarro and ArtsSpot Productions, all based in New Orleans, worked with Gulf Future Coalition, a culturally and racially diverse group representing fishermen, cultural workers, and more, who live and work on the Gulf Coast, from Texas to Florida. Their work together focused on using the original show Cry You One as a launching pad for a series of dialogue salons in five states to raise awareness of coastal issues and ensure local participation in decision-making regarding the allocation of Federal dollars coming to the Gulf Coast via the Restore Act.